Hap hap happy Friday everyone! 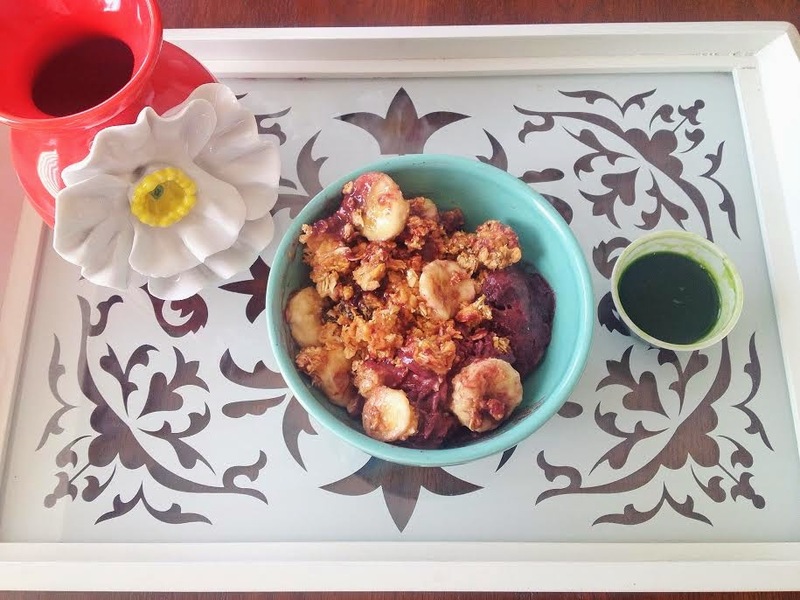 Ever since we went on vacation to San Diego, I've been obsessed with acai bowls (and wheatgrass shots!) but there was nowhere here in Columbus that sold them. It was a major bummer but finally a place called Pulp Hilliard (which happens to only be a 5 min drive from our house) opened last month and they make them! I'm so happy about this! Local gals..they have smoothies (just be careful of the sugar), fresh juices, and salad options as well. I found this website recently which has so many cute dresses for el cheapo! These are mahi mahi tacos (marinated in lime juice, cumin, chili powder) with a corn salsa on top...they were so fresh and delicious. Sweet potato wedges (with some cinnamon on top) and grilled zucchini were the perfect sides! Rarely does this happen...J. Crew Factory has 40-60% off everything right now!! Go stock up, ladies. You can get this shirt that I told you I've been wearing all the time for just $29 or this adorable striped peplum top for a heck of a deal! No coupon code needed. 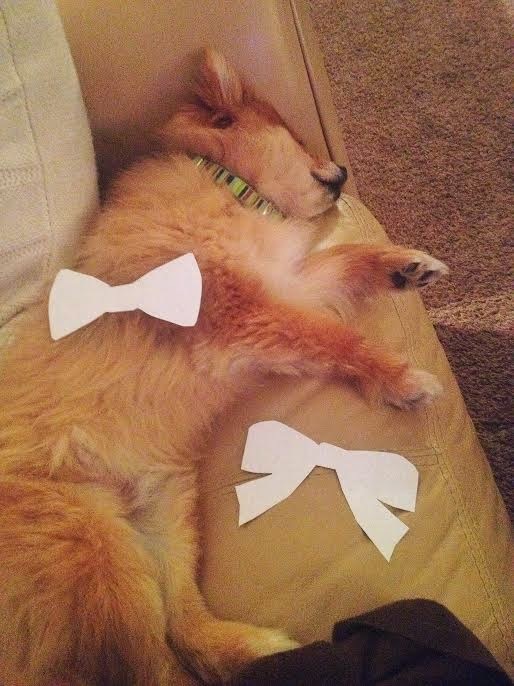 Rocky was not much of a help when prepping for Steph's gender reveal party... ;) What happened to my little helper?! Sleepin' on the job! The acai bowls sound good! Do you have a particular recipe that you follow? Rocky is too precious! Hemi sleeps on the job all the time! Those tacos look amazing too! Ok, so that website for the dresses is going to be me in trouble! ;) Didn't know if you knew this, but I just checked, and right now you can get an additional 25% off anything by using the code GET25! Eek! Like I said.. Trouble! I love when the weather starts to warm up and our salads get more colorful!! Thanks for the link to the dress site!! Hope you have a great weekend! Hi Katie. I just found your blog and also live in Columbus! I'm looking forward to learning your favorite spots around here! ahh i can't wait for summer fish tacos! are you going to come visit erica and me? you totally shoullllddddd. Thanks for the tip about the J Crew sale! Quick question... I have never ordered from them before, are returns easy with them? That's it, I'm crashing your house one night for dinner. 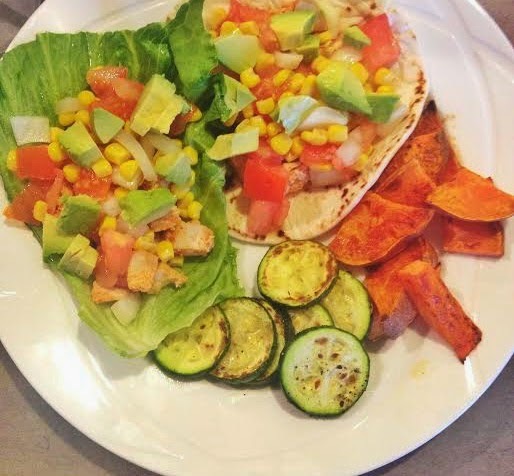 I love how your meals are always healthy, colorful, but yummy and creative as well! Those mahi mahi tacos look delicious! Also loving that maxi dress, makes me so ready for summer!